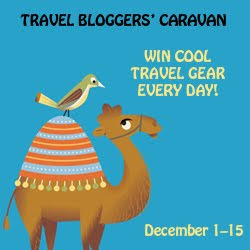 Beginning December 1, 2009, 15 top travel bloggers are banding together to spread holiday cheer to their readers. Just visit the Luxury Cruise Bible blog each morning from December 1–15 to learn about the travel expert of the day. From there, link to that expert’s blog and then enter to win the prize (or prizes) of the day. Prizes range from hotel gift certificates and overnight stays to digital cameras to camera bags to luggage to noise-cancelling headphones to travel guidebooks and DVDs. EllenBarone.com—Catering to individuals who enjoy a traveler’s lifestyle, the site is one-stop shopping for expert advice, vacation tips, product reviews, photo galleries and travel articles to help readers travel better, smarter, and more inspired. With an eye for the best, the authentic, the innovative and the irresistible Ellen loves little more than sharing information that will inspire readers travel now, travel smarter and travel often. Prize: Visit EllenBarone.com on December 12, 2009 and enter to win a day pack from First Ascent, a new extreme adventure line of gear and clothing by Eddie Bauer and partners (a $79 value). In addition, ExOfficio will be providing the ultimate travel ensemble! You could be trekking the globe in the latest ExOfficio outfit including; 1 Shirt, 1 Pair of Pants and 1 Pair of ExOfficio Underwear. Jeanine Barone is a New York City-based travel writer who’s written for just about every major travel magazine, from National Geographic Traveler to Travel + Leisure, as well as the Boston Globe, and other newspapers. She also blogs and is frequently asked to guest blog about her journeys. Her adventures can also be heard on various radio programs, such as KPAM in Portland, Oregon. When she’s roaming the world, she’s seeking out what she calls “hidden treasures,” in other words authentic experiences that provide insights into the heart of the land and its people. Aside from travel, she also pens articles on food, wine, design, and architecture. Whether she’s hiking through the volcanic landscape and vineyards on remote Pico Island in the Azores or mountain biking in Israel’s Negev Desert, Jeanine provides her readers with vivid, intimate experiences. So much so, that many have commented that reading one of her articles or blog posts makes them want to pack their bags and head straight for the airport. Known as an ultra savvy traveler, Jeanine is frequently asked to write about her travel tips (including how to stay healthy on the road) and her packing strategies, considering she prides herself in never checking luggage, even on a 7+ week journey. Prize: Visit JTheTravelAuthority.com on December 10, 2009 and enter to win a Mountainsmith Tour FX Camera Bag (a $99 value). Joshua Berman is an award-winning, Spanish teacher, and trip leader who has spent most of the last decade living, traveling, and working throughout Central America. He is the author of Moon Belize, and the coauthor of Moon Nicaragua and Moon Living Abroad in Nicaragua. His articles have appeared in a range of print and online publications, including National Geographic Traveler, The Boston Globe, Yoga Journal, and Transitions Abroad. His website is joshuaberman.net. Prize: Visit The Tranquilo Traveler on December 6, 2009 and enter to win a copy of Moon Belize, accompanied with personal travel advice from the author about your trip. Nancy D. Brown is the Uptake.com Travel Editor, writes the What a Trip blog and is a Contra Costa Times Lamorinda Sun columnist. She is the online travel editor for Diablo magazine and writes the “Traveler Making a Difference” column for Escapes magazine. An avid equestrian, Nancy reviews horse properties at www.writinghorseback.com. She enjoys speaking on panels and specializes in adventure and luxury travel. Recent trips include hiking Switzerland, snorkeling Mexico’s Paradise Reef, and paddling with the Hawaiian Sailing Canoes. Next stop: horseback riding in Germany and Norway. Prize: Visit What a Trip on December 9, 2009 and enter to win one of two Otterbox cell phone cases and a Baseline 20-inch carry-on expandable wide-body upright suitcase. Linda Coffman is an award-winning freelance travel writer who has been dishing out cruise travel information and advice in print and on the Internet for more than a dozen years. An avid cruise passenger who enjoys sailing on ships of every size to any port worldwide, Linda spends most of her time cruising the Caribbean and writing for Fodor’s Travel Publications. She is the author of Fodor’s The Complete Guide to Caribbean Cruises, The Complete Guide to European Cruises, and contributes to six other Fodor’s guidebooks. In addition, Linda created CruiseDiva.com in February 2001 to provide unbiased and practical cruising information to the thousands of Internet users who research their travel choices online. CruiseDiva.com was named a “Best of the Web” Leisure Travel web site by USA Today. The Atlanta Journal-Constitution says, “The Cruise Diva’s site has good information, lots of practical tips and lots of attitude.” When not at sea, Linda makes her home in Georgia. Prize: Visit CruiseDiva.com on December 11 and win a copy of Fodor’s The Complete Guide to Caribbean Cruises and a World Grounding Adaptor Set from Magellan’s Travel Supplies. John E. DiScala (a.k.a. Johnny Jet) travels around 150,000 miles and visits over 20 countries each year. He and his website JohnnyJet.com have been featured over 1,800 times in major publications, including USA Today, Time, Fortune, and The New York Times, and he has appeared on ABC, CBS, CNBC, CNN, MSNBC, NBC, FOX News Channel, and PBS. JohnnyJet.com has been named “one of the top best money-saving web sites for travel” by Budget Travel Magazine, while the L.A. Times calls it “one of the top 10 essential travel resources on the Internet.” Outside Magazine touted Johnny for having one of the world’s best “dream jobs”. Every week, Johnny hosts a “travel website of the week” for several radio stations around the country, he writes weekly for Frommers.com and he has written for USA Today, The Boston Herald, LAX Magazine, and Coast Magazine. Sign up today for Johnny Jet’s free weekly travel newsletter at JohnnyJet.com. Prize: Visit JohnnyJet.com on December 8, 2009 and win Alaska and Seattle Toursaver books plus a $50 gift certificate from Magellan’s Travel Supplies. I fell in love with Europe on my first trip to Paris more than 20 years ago. Since then, my husband Bill and I have traveled all over Europe, taking trips on the average of twice a year. During this time I have also run my own Europe-focused travel agency, planning hundreds of trips to Europe for my clients, friends, and family. Europe has won me over because Europeans seem to understand what life is all about: family, friends, and food. They have a deep appreciation for history and culture and in my opinion have perfected the art of living. At EuropeUpClose.com we have more than a dozen writers who are experts on European travel, and our articles are designed to share our years of first-hand travel experience… what we learned and what we love. We know the ins and outs of successful travel; where to find the best deals, how to save money, and how to find those hidden gems that many guidebooks often seem to miss. EuropeUpClose.com is an evolving and constantly updated travel guide, offering daily tips and travel suggestions. So, if you just want to dream of Europe, or plan your European vacation with confidence that you are “in the know”, EuropeUpClose.com is your insider guide. Prize: Visit EuropeUpClose.com on December 14, 2009 and enter to win a Fujifilm FinePix J28 10MP digital camera with 3x optical zoom. Andrew Hickey is the “Brooklyn Nomad” and he is always on the lookout for a great deal to…well anywhere. In addition to his blogging duties, Andrew is the social media manager for CheapOair.com’s all-new travel blog and contributor to Oyster Hotel Reviews “Locals” blog. Check him out at TheBrooklynNomad.com. Prize: Visit TheBrooklynNomad.com on December 5, 2009 and enter to win Imagine: A Vagabond Story by Grant Lingel, plus a $50 gift certificate from Magellan’s Travel Supplies. Donna L. Hull is so obsessed with travel that it makes her feet itchy when she’s not out exploring the world. At her blog, My Itchy Travel Feet, The Baby Boomer’s Guide to Travel, she writes about active travel for baby boomers, covering domestic and international destinations. Using her personal experiences and references as a travel writer, she advises boomers on where to go, what to do, where to stay, and how to prepare for an active trip. Donna recently completed an 8-part series based on a 52-day Pacific cruise for LuxuryCruiseBible.com. The Tucson-based freelance writer and photographer also writes for Uptake.com, iExplore.com, and is an “Outsider” at AdventureUs.com. Some of her print publication credits include AZ3Sixty Magazine, Oro Valley/Marana Magazine, Lovin Life After 50, Fifty Plus and Her Sports Magazine. Prize: Visit MyItchyTravelFeet.com on December 13, 2009 and enter to win the “Library Edition” of the most recent season of “Rudy Maxa’s World”, including six DVDs containing 13 shows on destinations in India, Turkey, Japan, Thailand, St. Petersburg, Estonia, and Argentina. Ciao Bambino is a family travel resource. Written by and for parents, we publish destination travel tips, advice, and comprehensive reviews of the best accommodations for families with kids of all ages. Prize: Visit CiaoBambino.com on December 7, 2009 and enter to win a one-night stay at the Westin Verasa in Napa, California, plus gourmet lunch for two on the Napa Valley Wine Train. Prize: Visit DreamofItaly.com on December 3, 2009 and enter to win a one-year online subscription to Dream of Italy plus a bonus DVD. Joni Rendon and Shannon McKenna Schmidt are the co-authors of Novel Destinations: Literary Landmarks from Jane Austen’s Bath to Ernest Hemingway’s Key West (National Geographic Books). They blog about literary travel at www.noveldestinations.com. Joni’s work has appeared in National Geographic Traveler, Travel + Leisure, Continental, and other publications. She currently resides in London, England and works at the Charles Dickens Museum. Shannon’s writing has appeared in National Geographic Traveler, The Miami Herald, and other publications. In April 2010, she will be leaving Hoboken, NJ, to set out in an RV and travel the U.S. and Canada for several years. Prize: Visit NovelDestinations.com on December 4 and enter to win a Literary Travel Prize pack including a tote bag, books, note cards, tea, bookmarks, and a keychain. Ship ahoy! LuxuryCruiseBible.com is devoted to helping travelers plan unique journeys aboard luxury cruise ships, river boats, and yachts throughout the world. Sail the Maldives on a catamaran, explore Burma’s Irrawaddy River on a sleek purpose-built vessel, or cruise the South Pacific on an intimate yacht. Every voyage is an adventure! Caravan Kickoff Prize: Visit the Luxury Cruise Bible blog on December 1, 2009 and enter to win a Lingo 16-Language Translator courtesy of Magellan’s Travel Supplies. Prize: Visit the Luxury Cruise Bible blog on December 2, 2009 and enter to win a $100 Marriott gift card. Mysterious, beautiful, majestic, fragile… the continent of Africa beckons! From the tombs of ancient kings and queen in Egypt to silverback gorillas in the mountains of Uganda to the Kalahari Desert blanketing much of Botswana, Africa offers a range of once-in-a-lifetime experiences. LuxurySafariExperts.com distills the options for visitors interested in seeing the sites and wildlife of Africa without sacrificing exquisite accommodations and excellent service. Prize: Visit LuxurySafariExperts.com on December 15, 2009 and enter to win noise-cancelling headphones courtesy of Magellan’s Travel Supplies. Visit the Luxury Cruise Bible blog each day between December 1 and 15. Link to the Caravan’s “blog of the day”, post a comment on that website, and you’ll be entered to win. Prizes range from hotel gift cards and overnight stays to digital cameras and noise-cancelling headphones to camera bags and luggage to guidebooks and DVDs.